This Nintendo 3D cake was one I would never have thought I could do. The birthday boy loved Angry Birds and requested a Nintendo 3DS cake like his real one. I wasn’t sure exactly how to pull this off for my friend’s son, but being a decent novice I decided to give it a try. 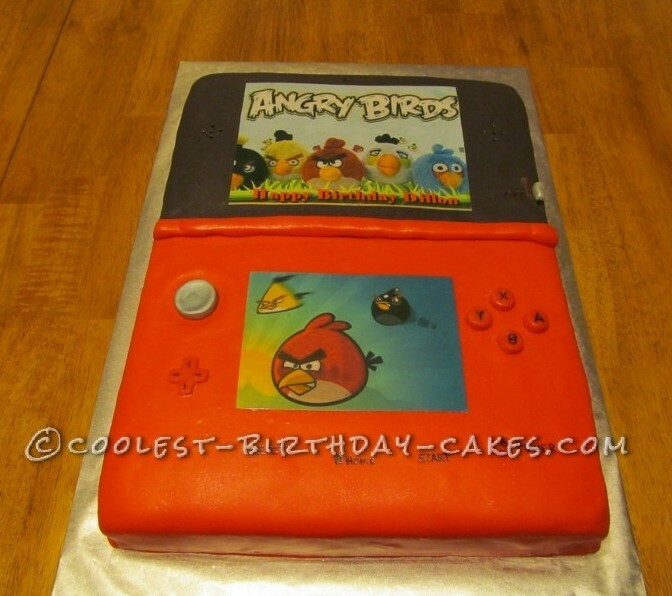 After looking at images online and using his Nintendo as a guide I created this cake from a 1/2 sheet yellow cake. The cake is covered in homemade marshmallow fondant and was easy enough to do covering each half in red and black. Even the knobs and buttons were created in the fondant and easy enough to do. Speaker holes are in the top simply formed by using a toothpick. Lettering and works on knobs and cake were done with an edible black pen. While in the planning stage I was very nervous as to how I would get the pictures on the cake. After much thought I decided to use the edible images that I have used previously on butter cream. I found images I wanted to use on eBay and contacted the seller and to ask if they could print each image in a size that would work on my cake. I also wanted to make the upper image appear larger than the lower image because of the way the screens actually are on the Nintendo 3DS. The seller was happy to do this for me and in fact was able to fit both images on one page so that I only paid for one sheet. This was easily applied to the fondant when the cake was finished with some thinned piping gel. This cake was so much fun to make and watch it come together. It was amazing how realistic it looked and the young man and his friends went crazy over the cake.